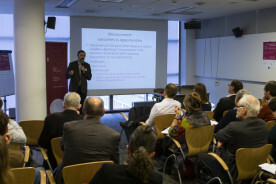 The conference began with Marc Fleurbaey's keynote talk "Welfare Policy and Beyond", and included sessions on different aspects of inequalities in the labour market regarding wages, technology, youth employment, as well as institutions and opportunities. Maurizio Bussolo and Iván Torre presented the key findings of the World Bank report "Towards a New Social Contract in Europe and Central Asia". The conference also included a policy panel moderated by Iga Magda, with Marc Fleurbaey (Princeton University), Carlos Piñerúa (World Bank Country Manager for Poland and the Baltic States), Paweł Wojciechowski (Chief economist of the Polish Social Security Institution - ZUS) and Tomasz Chróstny (Director of the Department of economic analysis in the Ministry of Enterprise and Technology). Panelists shared their insights on how to deal with the challenges posed by the emerging forms of inequality in Europe and Central Asia. The presentations and summary are available on the seminar website.